What you need to know about turbochargers. Maintenance and awareness to maximize service life and uptime and avoid costly failures. 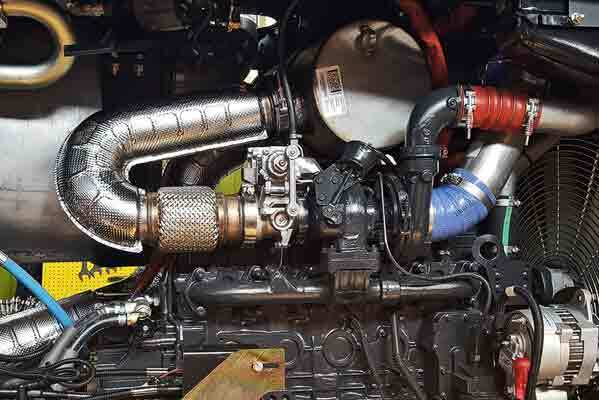 Turbochargers have been around for many years and have become an industry standard on most forestry machines. The amount of exhaust on the hot side of the engine controls the speed of the turbo exhaust turbine. As the speed increases, a greater amount of air is forced into the engine and more horsepower is produced. A steel shaft mechanically links the turbine to the compressor wheel and effectively controls the volume of air going into the cool side of the engine. Turbocharger speeds can reach well over 100,000 rpm. With faster rotational speeds, there is little room for error. Proper maintenance and operating practices can prevent damage or premature wear. Proper maintenance and inspection will extend the life of the turbocharger. Just as it is difficult to breathe when wearing a plugged dust mask, a turbocharger also relies on the cleanliness of the air intake system to work efficiently. Air filtration is the first line of defence for the turbo from dirty atmospheric air, as it prevents contaminants from coming into direct contact with the compressor inlet. The outside air enters the pre-cleaner then circulates through the primary (outer) filter element. Then it passes through the safety (inner) filter and finally toward the turbo inlet. To keep this system working efficiently, any debris accumulation around the pre-cleaner such as branches, snow, dirt, mud or leaves must be removed at least every eight hours and more often if working in challenging conditions. This will help keep the turbo vacuum pressure within limits and lower the longitudinal strain on the shaft at high speeds, preserving the life of the seals and internal parts of the turbo. A plugged filter will cause the turbo speeds to increase because there is no load on the compressor and this in turn can cause the turbo to fail. ANY TYPE OF CLEANING IS ONLY AS GOOD AS THE PEOPLE, METHODS, TOOLS AND INSPECTIONS USED IN THE PROCESS. It is NOT recommended to CLEAN the filter. The air cleaner element should only be replaced when indicated by the filter restriction indicator, as opposed to proactive replacement. Over-servicing may render the system less efficient, as it relies on some filter dust build-up to maximize the filtration capabilities. It is not recommended to clean the filter. There is a risk of contaminants reaching the clean side of the filter and risk of filter damage from high pressure compressed air. Any type of cleaning is only as good as the people, methods, tools and inspections used in the process. The secondary (safety) element should never be cleaned, only replaced. Keep the filter replacement procedure brief to prevent any contaminants from entering the intake system. A clean rag can be used temporarily to block the intake port but it is crucial that it is removed before reassembly. The finest of dust, sand and dirt particles can have a severe impact on the turbo, causing pitting, scoring or even total fracture of the compressor wheel fins that could result in catastrophic failure. Turbos are finely balanced. The smallest of cracks to the assembly can unbalance the system and accelerate failures. A warm up is important before exercising and it would only make sense to seek shade with a nice cold glass of water after running in hot weather. The same goes for your machine. The oil must be warmed before working the machine and the turbo must be allowed to cool before shutdown. Proper lubrication is essential to cool the turbo. Remember, it can spin over 100,000 rpm. Turning off the engine right after working the machine hard means the lubricating oil flow by the pump will be turned off while the turbo is still spinning at high rpms for several minutes. With no oil, there is no way to quickly remove the heat. This can cause premature wear to the shaft, bearings and seals and shorten the life of the turbo. The same can happen by not allowing enough time for the oil to warm on start-up. Cold oil moves more slowly, delivering inadequate lubrication to the bearing. Always use Tigercat branded filters to protect the engine and components. As mentioned, proper maintenance procedures will help extend the life of the turbo. The tolerances within the rotating parts of the turbo are very small and rely on good quality oil to keep all parts moving flawlessly. Always remember to replace the oil at the recommended service intervals or even sooner if there is a risk of contamination. Dirty engine oil can quickly reduce overall life as it permanently scores the bearings and shaft. These imperfections in the surface of the material then leave room for further contaminants to settle and accelerate wear on the parts. A rough surface also restricts oil flow and its ability to remove the heat. During the combustion process of the engine, there are combustion vapours (blow-by gas) that escape past the piston rings into the engine crankcase and mix with the oil vapours. To prevent over-pressuring the sump, these vapours are filtered from the oil and returned to the turbo inlet pipe, while returning the condensed oil to the sump. On Tigercat FPT 6.7 and 4.5 litre engines, the CCV upper case filter is located directly above the engine flywheel housing and is specifically designed to match the engine. For this reason, only Tigercat branded filters should be used. A filter that looks the same does not necessarily mean it is the same. CCV filters have a specific oil separation media to control the blow-by gasses and have been designed and manufactured specifically for the application with proprietary materials to work in unison with the rest of the system. Filters with specifications unfit for the applications can have a negative impact on the overall performance. Some of these include blow-by gas flow rate, crankcase pressures, filter porosity and reduced service life. Seeing some oil at the turbo is normal – the combustion vapours directed to the intake can be mixed with some residual oil that is usually burned during engine combustion. Some of this oil can settle in the pipe just before the turbo inlet and as such, it is normal to see oil in small quantities. What is important to remember is to replace the CCV filter at the recommended service interval with a Tigercat branded filter. This often neglected filter plays a very important role. Incorrectly servicing this component can result in filter saturation and allow oil to build up at the turbo compressor inlet and outlet. This reduces engine performance and turbo boost pressure due to the restriction on the compressor wheel caused by coking and can negatively affect components downstream of the turbo exhaust. Left too long, this can lead to turbo failure or even engine failure. Just as monitoring the fuel, engine speed and oil gauges is second nature when driving your car, keeping an eye on the machine’s boost pressure can help catch any concern in the early stages. Should the boost pressure appear to be low or drop suddenly, the operator should be proactive and adjust/ investigate accordingly. Since it is easily accessible and fastened with only four bolts, the turbo is often replaced prematurely in a low boost pressure event. Some factors to review and consider beforehand are loose or worn charge air connections, restricted air filters, blocked pre-cleaners, saturated CCV filters and worn gaskets between the turbo and intake/exhaust manifold. In an event where the shaft or compressor wheel breaks, the turbo boost pressure will decrease significantly. At this time, stopping the engine immediately is crucial as continuous operation can allow a large amount of oil to reach the engine intake and enter the cylinder chambers. The significant amount of power generated from the oil mixing with the fuel and the air during the combustion process can cause severe damage and has the potential to bend the connecting rods resulting in an engine replacement. The oil can also contaminate exhaust catalysts, resulting in extensive repairs. Education is the key to success. Make sure that everyone on the crew knows how and why the system works. It can positively influence and motivate the team to use best operating practices, perform correct maintenance procedures at the required intervals and to have an awareness of potential issues. This will go a long way in keeping the engine and turbo system working flawlessly.